Tue., March 11, 2014, 5:08 p.m.
Patrick Afif has been living on the edge for most of his life. It only got edgier once Afif left left the outdoor game behind and joined the Arena Football League. 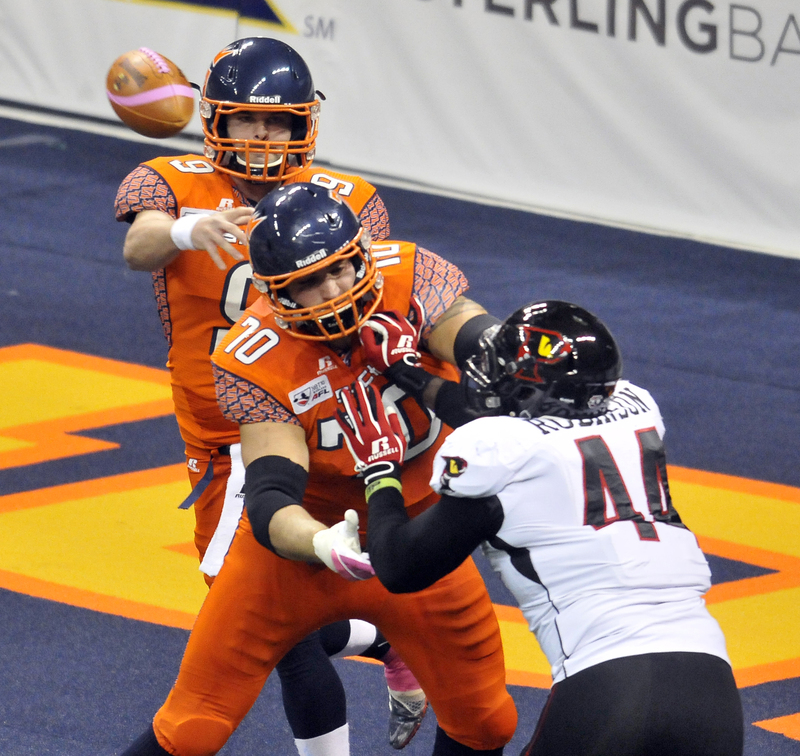 “There’s no place to hide,” said Afif, nine-game starter at offensive left tackle last year for the Spokane Shock and now the protector of quarterback Erik Meyer’s blind side. And when he fails? Afif takes it personally. “Unless there’s something crazy, if I get beat on the left side, it’s my fault,” said Afif, who also is enjoying a homecoming of sorts in the twilight of his career. After a stellar high school career in Southern California, Afif played two years of junior college ball before former Washington State coach Mike Price recruited him to Pullman. “And as soon as I got there, he was gone,” said Afif, who played at tackle for Bill Doba’s Holiday Bowl team in 2003 and became a full-time starter for his senior year in 2004. “I fell in love with Pullman, the college atmosphere and the family feeling – those were two of the best years of my life,” said Afif, whose NFL aspirations were derailed by a knee injury that could only be tested on the field. And so he did, joining the Spokane Shock in their inaugural af2 season in 2006 before embarking on a six-year pro football odyssey that covered four time zones and three different leagues. One-year stints with San Jose Saber Cats in 2007 and Arizona Rattlers in 2008 led to a tryout the following year with the Toronto Argonauts of the Canadian Football League. When that didn’t work out, Afif got into the AFL ranks with Orlando before playing with Edmonton of the CFL in 2010. Olson expects another big year from Afif and right tackle Duke Robinson as the Shock look to improve on last year’s 66.6-point scoring average. It’s not that simple: the eight-man AFL game moves more quickly than the 11-man variety. “The ball comes out a lot faster,” Olson said, adding that’s it’s a tough transition for many former collegiate players. Afif is more of a tackle-guard hybrid, always living on the edge. “You can’t hide from anybody – it’s exciting,” Afif said. It’s also coming to an end someday soon, said Afif, who’ll turn 31 next week. He wants to go out in style. He hopes to bookend his 2006 championship ring while also making the all-Arena team. “I came in with a bowl ring and I want to go out with a bowl ring,” Afif said. Published: March 11, 2014, 5:08 p.m.